Last year at the Anarchist Conference, there was general consensus that a proposal to do something big to mark 2012 was a good idea. No, not because of the Olympics, but because it’s the centenary of the Jewish tailor’s strike in London’s East End that was the high point of anarcho-syndicalist Rudolf Rocker’s influence in the UK. 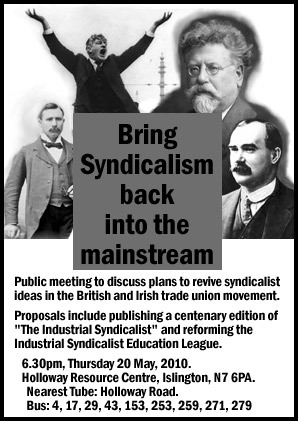 As I thought about it, I looked into the period between 1910 and 1914, known as the Great Unrest, when syndicalism was a major force for change in the UK. I realised how ignored this part of the history of these islands (Ireland, at the time, still being part of the UK) has become.